What if you could challenge your third graders to design the train of the future? With this volume in the STEM Road Map Curriculum Series, you can! 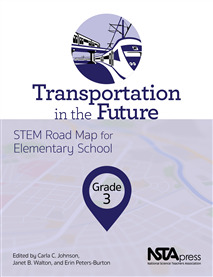 Transportation in the Future outlines a journey that will steer your students toward authentic problem solving while grounding them in integrated STEM disciplines. The series is designed to meet the growing need to infuse real-world learning into K–12 classrooms. •	Learn about U.S. geography, explore the role of trains in the nation’s development, and consider train travel in the 21st century. •	Develop conceptual understanding of innovations in train technology, with a focus on maglev (magnetic levitation) trains. •	Use inquiry activities in science to learn about magnetic interactions and use mathematics to calculate distances and time intervals. •	Apply this knowledge in the Maglevacation Train Challenge, working collaboratively while using the engineering design process. Your students will create a prototype train to safely carry passengers a given distance and then prepare a presentation about their destination and their train’s design features. The STEM Road Map Curriculum Series is anchored in the Next Generation Science Standards, the Common Core State Standards, and the Framework for 21st Century Learning. In-depth and flexible, this resource can be used as a whole unit or in part to meet the needs of districts, schools, and teachers who are charting a course toward an integrated STEM approach.